We are a bunch of dynamic, augmented reality app developers! Augmented Reality (AR) is an innovative technology which allows our real world to be enhanced (or “augmented”) with the digital world. AR enables devices such as computers or smartphones to use their cameras to locate and identify specially designed AR “markers”. When a marker is recognized, the device will project a super-imposed 3D image, sound, and/or video on the device screen which will combine with the “reality” that is being viewed in the real world. AR may be triggered by markers or else may be triggered using “markerless” technology, meaning that pictures or objects may be detected that trigger the AR rather than more standardized markers (QR codes, etc. ), for example a face could be detected or items such as a soda can or company logo. Another type of markerless AR can be triggered by geo-location information (via GPS and the device’s compass). For example, a person may view a location through their camera’s viewfinder and will be able see additional information displayed based on their current location (such as distance to a nearby building or landmark). Augmented reality graphics and sounds are displayed in real time and can be interactive, and even manipulated by the user depending on the application. AR activated visualizations may contain still images, videos, audio, 3D models, 3D animations and even interactive objects. Augmented Reality technology aims to enrich the way in which people perceive and interact with information in their surrounding environments. Augmented Reality creates new and exciting marketing channels for businesses to uniquely connect with clients. We can help you develop customized Augmented Reality software and AR markers which will capture audience attention and engage consumers. We work closely with our clients to design and build unique AR tools so your products are visualized in a memorable and innovative way. 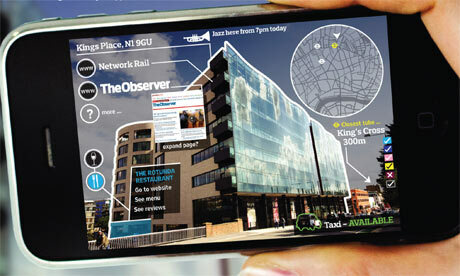 – Augmented reality apps for augmented reality advertising. Please contact us to learn more about how Augmented Reality can help you to take your marketing operations, products, and services to the next level.